With its 460cc-sized club head and deep center of gravity, the TaylorMade Men’s Burner 460Ti has to be considered one of the best drivers on the market today. The super light shaft produces a much faster swing speed for the golfer, which allows for greater distance off the tee as well as straighter shots down the middle of the fairway. The stock Burner comes with lofts of either 9.5, 10.5, or 13 degrees. The 13-degree Burner would be for a senior who is having trouble getting the ball in the air. However, that should not be a problem with this particular club, as the standard shaft is the 50-gram TM RE*AX shaft which gives golfers a higher ball trajectory off the tee. This results in longer, straighter shots for golfers of all ability levels. The face, body, and crown of the Burner’s club head is all made of titanium, and the face comes 1-degree closed. By shipping the driver with a closed face, this alleviates the problem that many amateurs have related to hitting a natural fade. Fades will ultimately cut down on the distance the golfer is able to reach off the tee box. The TaylorMade Burner 460 is able to harness that fade and return a high, long ball flight that is sure to give you 20-30 extra yards. It is the club’s customization features, however, that truly set it apart from any other club in its class. 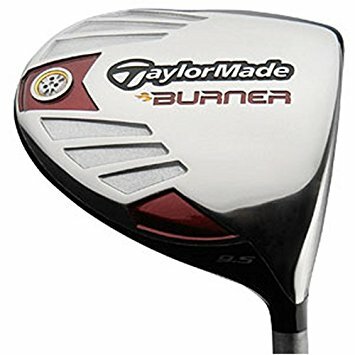 From different lie angles to various loft and shaft combinations, the TaylorMade Burner 460 really does cater to the golfer’s distinct style of swinging the golf club. The slow swing speed players will notice that the light regular-flex shaft and high-degree club head produce a higher ball flight to get maximum distance out of the shot. Faster swing speeds are likely to find a stiff-flex shaft and lower-degree club head will allow them to keep the ball from going too high while still maximizing the amount of carry and roll the ball will ultimately recognize. If you want to buy this golf club, you can get it cheapest through this link here on Amazon. A great driver at an equally great price, the TaylorMade Burner 460 Ti is sure to be the right club for just about anybody that gives it a try.